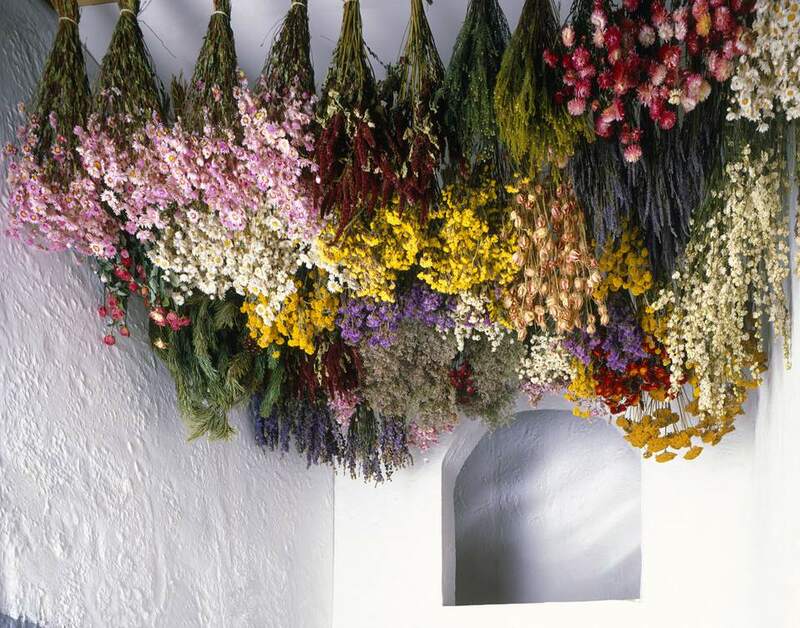 Drying flowers allows you to keep them around to display for months, maybe even years, after the plant has stopped blooming. There are flowers, like the aptly named strawflower (Xerochrysum bracteatum), that seem to dry themselves, while others are just too succulent to dry fully. Here are some tips for choosing flowers to dry, drying them, and keeping them looking good. Some flowers just work better than others. Flowers with a high water content, like sedum, don't air dry well. Below is a partial list of flowers that are good choices, but the best way to learn which flowers work is by experimenting. Always cut more flowers than you will need because you will probably lose some in the drying process. The best time to harvest your flowers is late morning, just after the dew has evaporated from the leaves. In general, most flowers do best when cut slightly immature, with the bud not fully open, since the flower will continue to open once cut. Often fully open flowers will drop their petals as they dry. However, do some experimenting and see what stage of bloom works well for your flowers. Air drying is the simplest way to preserve your cut flowers. Gather the flower stems into small bunches, about a ½ inch in diameter, and wrap them tightly with a rubber band. The stems will shrink slightly, so make sure the band is tight. Hook a paper clip through the rubber band and hang the bunches, upside down, from the ceiling, with a hook or string. Keep them upside down so that the stems don’t bend from being top heavy. If you are only drying the flower heads, not the stems, you can lay the flowers out individually on a screen. The other requirements remain the same. The flower bunches will need to be hanging out of direct sunlight, preferably in darkness. The more sun the flowers are exposed to, the more their color will fade. Don’t group the bunches too close to one another. Good air circulation and low humidity are also important factors in drying flowers. Make sure there is space for air to flow between the bunches. Drying times will vary depending on the type of flower and conditions like humidity, temperature and air circulation. Most flowers will take somewhere between 10 to 20 days. You will know they are dry when they feel stiff and the stems snap easily. Use a shallow, airtight plastic or glass container. Spread a 1-inch thick layer of the silica gel on the bottom of the container. On top of that, space your flower heads. Then gently cover the flowers with at least another inch of gel. Seal the container and let it be for 3 - 5 days. Some flowers that benefit from silica gel drying include anemones, daisies, pansies, and zinnias. If you’d like to speed the process even further, you could microwave the container with the flowers and silica gel, for about 3 minutes. Let the container cool for 20 minutes before opening. Check that the flowers are fully dry before removing. Once the drying process is complete, you can begin enjoying your flowers in arrangements, wreaths, and crafts. You will still need to give them minimal sun exposure, to retain their color. It would also be wise to keep them away from forced air heat, which can make the already dry flowers become brittle. As with everything else on display in your house, dried flowers will become dusty. A delicate feather duster can usually be used on them, without causing any damage. You might also try a blow dryer on cool or low. If you are going to be storing your dried flowers, wrap them in some newspaper, to prevent them from drawing in moisture from the air. Then place the wrapped flowers in a box, so they don’t get accidentally crushed. Keep them out of damp basements and overly dry spots, like attics.